Welcome to day 1 of your Expand Your Income Potential training. Everything you'll learn here has the sole intention to increase your effectiveness while marketing your business online. Whether by cutting down on your time investment looking for free advertisement, or by introducing better cost management for your current campaigns, this training assists you in the expansion of Your Income Potential, no matter how big or small. Before going over where to invest your time and money, we need to determine how your efforts will communicate to each other, to create a continuous, smooth flow of traffic, a lasting brand identity and an uniform message. Most marketers out there have no conscious plan in action, and they get caught up by all the shiny, bright lights, changing their message to whatever the shiniest Guru is selling at the time. You, my friend, is smarter, and will create a conscious marketing plan, with uniform, integrated communication. Just like a puppeteer pulling the strings, when you're paying for traffic you have the ability to direct it anywhere you want, which is a highly powerful feature for your marketing. As you can see, I have 3 different landing pages - these could be labeled "home business", "company-specific", and "product-specific", for example. All landing pages talk directly to the visitor's needs, and guide them to your main domain, where they will find the solution to their problems. With organic traffic, your approach is much less aggressive, and focuses on long-term effects. Instead of simply telling people to visit your website, your efforts are geared toward positioning and personal branding. On this category, what you offer the community, and how the community sees you is much more important than whichever benefits your website might offer. We'll discuss this in depth when we get to Social Media. The key aspect of organic traffic is to have control over where your prospects will land on your system: you might want to direct them to a landing page, to educate them on specific aspects of your product/company, or simply send them to your main domain. Either way, make sure their visit is guided as best as possible, so they experience exactly what you want them to experience. And however you decide to do this, don't ever send traffic straight to your sales letter. 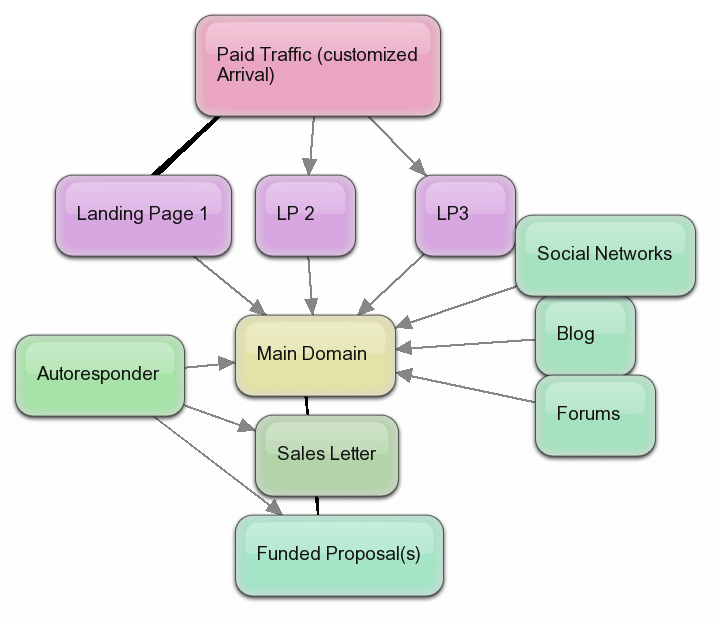 From the picture, notice that Static and Organic are the entrance to your Sales Funnel. Your landing pages (for Static traffic) and content (for social media) have to communicate the same message no matter which platform you're using. So, Day 1 was all about Integration. You learned how to set up and design an effective Marketing Blueprint, and how to feed your Sales Funnel. Visit http://bubbl.us and design yours. Tomorrow, we'll go over FREE Static traffic generators.